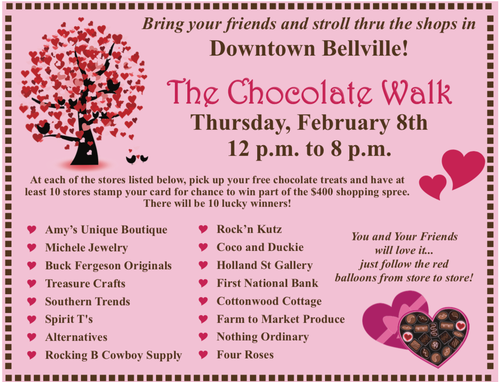 In celebration of Valentine’s Day businesses on the square in Bellville will hold the annual Chocolate Walk the Thursday before Valentines Day. Participating businesses will be marked with red balloons. The Chocolate Walk begins at 12pm and will end at 8pm. When you visit each store, pick up your chocolate treats and have at least 10 stores stamp your card for a chance to win part of a BIG shopping spree. Cards are available at all participating merchants. Downtown Bellville ... on the Square!